2010 June 18 Steve Nguyen, Ph.D.
Ronald Reagan was known for his communication skills. 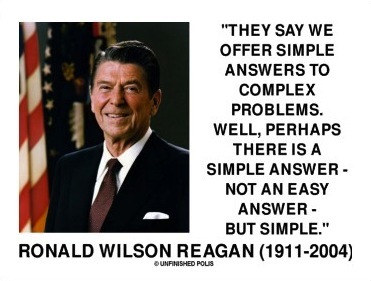 In fact, his nickname was the “Great Communicator.” I came across part of the quote below in Weiss’ (2006) book and really like what former President Reagan said about simple answers. As a consultant and trainer with experience in education, mental health, crisis management, and training & development, I have encountered difficult and complex situations. But, no matter how confusing or overwhelming the problems may sometimes seem, I have always believed that the answers were not. NASA astronauts and brain surgeons have jobs that are complex. Most jobs, however, are not. You either do it or you don’t. You move ahead or stand still. You make a decision or don’t. And yet, people tend to add an unnecessary layer of complications to sometimes uncomplicated problems or issues. From my experience, I think many of us already know what we need to do (at home and in the workplace). It is the FEAR that keeps us from following through with actions. For instance, I have talked to people who were unhappy about certain aspects of their lives. Some, for example, lament how unhappy they were to be where they’re at in life. They complained that they hate this or that, and yet as much as they complained they never actually did anything to change their circumstances. In our microwave mentality, we sometimes want it and want it now. We turn to self-help or leadership books and read blogs (like this one) for answers. The bottom line is that the “answers” are sometimes quite simple. The toughest part is not figuring out the “answers,” but rather, mustering up the courage to act. Weiss, J. (2006). The quotable manager: Inspiration for business and life. Layton, UT: Gibbs Smith.